Frank Staines' headstone, St Mary's churchyard, Bottesford. 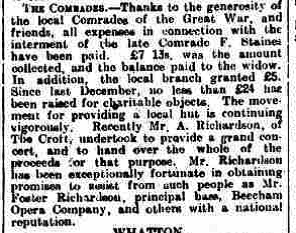 Grantham Journal, 27th November, 1920 - Article reporting the support given to the Staines family with regard to the funeral and interment expenses by the Comrades of the Great War. Records of Private Frank Staines’ life and military service are scant, yet it is clear that he was one of the tragic cases of a soldier who died soon after being discharged from the forces and arriving home. 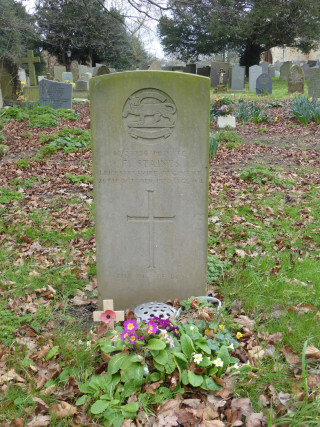 In his case, he had returned to his family at Bottesford, but died at Easthorpe in October 1920 (of uncertain cause). He is not commemorated on the village War Memorial, yet he can hardly be said to truly have been a survivor. Frank Staines was born in 1876, at Muston (Grantham Registration District). The census of 1891 records that, on Village Street, Muston, lived John Staines, a 60 invalided agricultural labourer, born in Muston, his wife Emily Staines, 59, also a native of Muston, and their son Frank Staines, then a 15 year old farm servant born in Muston. Frank Staines married Ellen Jane Gale early in 1900. In the census of 1901, the couple are recorded living on Woolsthorpe Rd, Muston. Frank was 25, an ironstone labourer filler born in Muston, Ellen was 34 years old, also from Muston. By the 1911 census, Frank and Ellen Jane had moved to Stathern, Frank now 36 was an ironstone quarryman, Ellen Jane was 44, and they had an infant son Albert Ernest Staines, aged 1. He served as Private 23736, Leicestershire Regiment, and then as Private 599962, Labour Corps. He was one of the older recruits to the army, being 38 when the war broke out. The Leicestershire & Rutland, Soldiers Who Died 1914-1920 (Michael & Peter Doyle, Find My Past) provides the following detail: F Staines, 44, 599961 Private, Labour Corps, formerly Leicestershire Regiment, High Street, Bottesford, died 26/10/1920, buried St Mary’s, son of John and Emily Staines of Muston, and husband of Ellen Staines. Frank Staines sadly died at home in October, 1920. The cause of his death has not been found. THE COMRADES – Thanks to the generosity of the local Comrades of the Great War, and friends, all expenses in connection with the interment of the late Comrade F. Staines have been paid. £7 13s was the amount collected, and the balance paid to the widow. In addition, the local branch granted £5. Since last December, no less than £24 has been raised for charitable objects. The movement for providing a local hut is continuing vigorously. Recently, Mr A. Richardson, of The Croft, undertook to provide a grand concert, and to hand over the whole of the proceeds for that purpose. Mr Richardson has been exceptionally fortunate in obtaining promises to assist from such people as Mr. Foster Richardson, principal bass, Beecham Opera Company, and others with a national reputation. Staines – In loving memory of a dear husband and father, Frank Staines, who died at Easthorpe, October 25th, 1920. From his loving wife and children. Frank Staines’ gravestone stands in Bottesford churchyard. Details of Private Staines' military service and awards have not yet been located.